The only exception to the rule is that Firefox 52 will support Adobe Flash. All other plugins, Silverlight, Java, and all the others, won't be supported anymore in the Firefox version. Some Firefox users may be inclined to block updates of Firefox 51.x to avoid being upgraded to Firefox 52 or later. This is not really advised though, as it means that security updates won't become available for that version of Firefox anymore. The risk of successful attacks increases because of this. 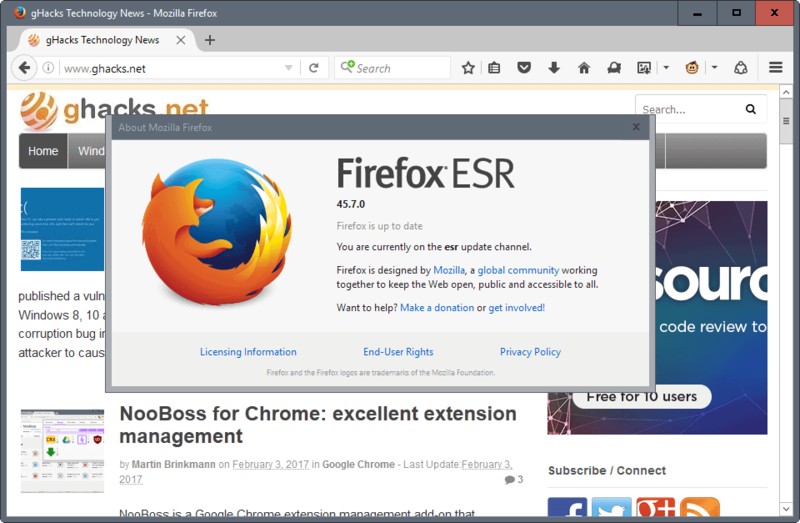 Firefox 52.0 ESR will be released alongside Firefox 52.0. This is good news for anyone requiring plugins, as Firefox 52.0 ESR will continue to support plugins whereas Firefox 52.0 won't. The second file that you need to modify is update-settings.ini. It is located in the root folder of the Firefox installation, e.g. C:\Program Files (x86)\Mozilla Firefox. They’re dumping support for Widevine, Adobe Primetime Content Decryption, and OpenH264?? Won’t that break sites like Netflix, Hulu, etc? Here’s the bottom line with me. If they break my sites and my habits, I’m switching to Chrome, or Vivaldi. They’re already planning to end support for several key add-ons which are the primary reason I use Firefox in the first place. It’s like they don’t want the power users anymore. If that’s the case. See ya, Mozilla, was nice knowin’ ya. Those are the DRM plugins (not NPAPI). Those will all still be there. Widevine, Adobe Primetime Content Decryption, and OpenH264 are not classified as “plugins” in this sense of the word, they are a different pre-bundled (internal) content called GMP (gecko media plugins). It’s external plugins that are being dropped, excluding flash. Widevine support is NOT being removed. They are dumping Adobe primetime (probably because no major sites use it, neflix etc… uses widevine), but they are NOT dumping widevine or openh264 (and afaik open h264 is only used for webrtc anyway). No, those won’t be removed, they don’t use NPAPI. Chrome dropped supporting for plugins a long time ago, which is mentioned in the article . And Firefox don’t end support any addons, only developers do that. No,they are dropping NPAPI extension support; Widevine, Adobe Primetime Content Decryption, and OpenH264 are not NPAPI plugins and so won’t be affected by this change. Only things like Silverlight, Java, VLC Plugin and Microsoft Office are going to be dropped. What’s going on with LastPass? That’s an extension, not a plugin. It will still work. Ok…but what’s going on with LastPass? It’s still stuck on version 3.3.2, on AMO. Whie I don’t use any plugins, I don’t like the restriction of user choice. I’m not affected by this at all, system-wide I have no plugins installed, I keep Chrome PAF in case I need Flash. Or you could switch to Pale Moon, which is committed to retaining support for NPAPI plugins, as well as the technologies used by most Firefox extensions (which Firefox is also planning to ditch in a few months time). This is probably the best options for those who require a plugin that is not Flash, since Flash will keep working. It’s not a good idea for privacy to disperse the user base across different versions. I haven’t used a non-Flash plug-in for, like, 10 years ? More ? The only plugin i use is “VLC Web Plugin” and that’s on my Windows XP, i don’t need that plugin or VLC Media Player for my Windows 10 and 7. i’ll have to see for sure how Firefox on Windows XP gets upgraded to version 52 when March 7th comes around. i believe it’ll automatically be upgrade to 52 ESR. Regardless, i’ll probably officially retire my Windows XP by the end of this year. And if the Laptop still runs good i’ll put one of the newest Linus Mints on it and see how it runs on there. Laughing at the people that don’t want to evolve. A plugin free web, a plugin free browser. Can’t wait to see Flash plugin die in Chrome too. Completely. Break your digital shackles! I’m surfing plugin free since 18months. And so do you want a medal? Everyone is different. Many people are pissed off about Fire Fox 52 (ESR) not having the primetime content decryption module there and working because some websites now won’t play videos. Google may have ended support but even on their versions as old as Google Chrome 49 you can watch more videos online with that than you can on Fire Fox 52 (ESR) which is messed up. Seems like Mozilla wants people to dump their browser all together. So…where is the replacement for this AWESOME download manager? Chrome has nothing like it I believe. I use it religiously to download Youtube videos. Cause…yanno…the download functionality of Chrome and clones is the most backwards junk. You can’t pause and restart many downloads, wasting time and money. Final goodbye to Firefox is near for me, so sad. what on earth is the point of evaluating waterfox and other clones..they too will face the same predicament. To Gary H: Very sad? Yes, but you have alternatives, if you want to look for them, to know one alternative (a very good one, IMHO), please read the rest. To Dave: Please evaluate Pale Moon browser as well (www.palemoon.org), it’s a highly optimized fork from Firefox with support to NPAPI and the classic XUL extensions, please keep reading to know more. Optimized interface: highly customizable UI with a look and feel of the familiar pre-australis Firefox. Just look on Google (add on name) old versions. You’re likely to find a version that will fit into the ESR. For now I’ll respect the Firefox development intent, and use IE11 under Windows 10 x64 Home to run Java, an infrequent requirement for me. Good move. Kill flash also please. Was at 42 for a while, “upgraded” to 51 and being very close to installing 42 again. Booooh, kill plugins now! Vote Open Web. Good riddance. Wish all browsers would drop Adobe Flash too. You are both dumb. What for? Because Flash uses less resources to process the video? And because it is more compatible? (yes, the number of browsers that can run flash is bigger than the number of browsers that can play the video through HTML5, concerning older versions). You are voting not for an “open web”, but for a restricted, non-extendable, really resources hungry Web. Have you not noticed that most HTML5 websites and JS codes these days use way too much more hardware resources to give the user more or less the same result on the screen? Because of retards like you two, computers capable of doing billions of operations per second start to become “slow” or even “obsolete”. Computers of today should be doing everything with blazing speed, but the overall speed effect (of loading websites, for example) is more or less the same as we had 10 years ago to produce the same result on the screen. I mean the usual web experience, putting the hi-res videos aside (processing them has nothing to do with browser rendering text, pictures and tables). Optimization and extendibility is the right way to go. Unfortunately, not nowadays. I think this situation exists because of three factors: on one hand there are so-called programmers that are programming with a mouse and know nothing about CPU cycles nor about what a byte of information consists of. On the other hand there are stupid consumers that do not want to know anything, just wanting to use Facebook even if that will require to buy a new computer. And there is also a very hungry business behind this all that wants the sales to go up forever. People who support these tendencies and consider themselves to be technically-literate should be ashamed. Go study informatics first. Unfortunately, my primary bank (a very large credit union) requires the Java Runtime Environment in order to make on-line deposits. So, now having updated to FF 52.0, I shall download ESR 52.0 and over-install it; my only other option is to use IE 11 (Win 7 Pro x64), which is not particularly appealing. Oh, well… . There is an override to reenable plugin support in Firefox 52, at least for the time being. You can go into about:config and create a new Boolean preference called plugin.load_flash_only and set its value to false. That should allow you to continue to use Java for your bank. No telling when Mozilla will remove this, so Firefox 52 ESR might be the better option. Ok – need advice from the Experts! to my existing FF version 51. (keeping my current FF 51)? or do next to install FF 52 ESR ? “pick up” all addons I currently use?. I was thinking on switching to another browser for some time because my Firefox was always having some hang ups while opening a website or freezing the entire browser while accessing a page with youtube videos/flash/etc and while scrolling up/down a page. Now with this version my worries are all gone. I don’t know, I just don’t know, I am sitting with FF42, the so called upgrades to FF seem to break my functionality with certain add-ons. I like the concept of being able to tweek what I want and I feel safe with ublock origin, ghostery, do not track blah blah blah. . . I like my xmarks and my bank and all my secure logins to my union, the local job database/service all run with java, why should I lose my functionality? I am not a noob or lazy, I go into about:config and play, I get my FF to look and feel how I want it to, so why screw with a good thing, sometimes constant “improvement” for improvements sake can be the wrong direction. I have a webcam that is now non-functional because it requires a plugin to operate. 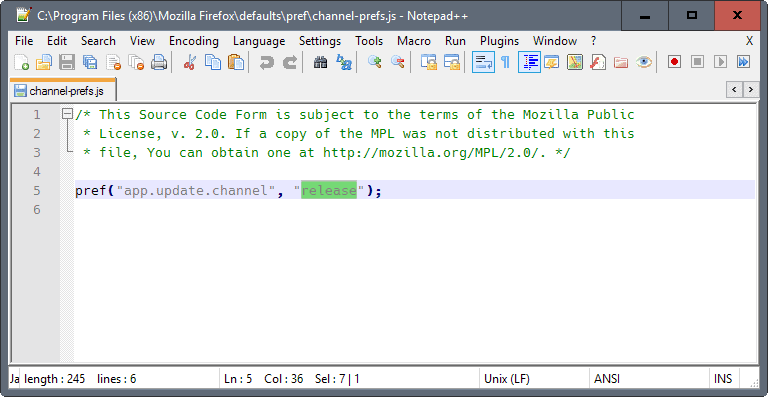 Did you see my comment above about how to reenable plugins for Firefox 52? If you do that, you can still use your webcam plugin. Couldn’t listen to radio show needs Microsoft Windows Media Player Firefox Plugin looks like, so put ESR, anyone know a plugin free way? Some stations only use a browser plug-in, typically the Adobe Flash Player (though some use a different third-party browser player that frequently also requires the Flash Player). However, many stations also have dedicated streams in various formats, the most common of which is MP3 (others include AAC and HLS). If the station in question does offer one of these audio streams, then you can do a quick search for a free media player that meets your needs (personally, I prefer to use the old and obsolete Winamp for radio streams, but there are many to choose from that are current). As an aside, an excellent source for stream links (as well as program scheduling) is http://www.publicradiofan.com/ (non-commercial stations, world-wide). Firefox 52.0 does not support alternatiff, which is used on many recorder of deeds website to view online deeds and mortgages. It suggested using Windows photo viewer, which did work, but when I printed the page to my PDF printer the file size was immense. I’ll probably play with photo viewer to see how to make it work better (probably something to do with colors), but in the meantime I downloaded the ESR version. Same problem here. I have not been able to find a fix yet. Is more simple way stop use Firefox, I go to russian Yandex Browser is Opera fork but more usable. if their wish is to “conquer and order out of chaos” so they are on the way of success. it’s now up to the REAL open source developer community to react. Hello,maybe awkward solution but try install comodo icedragon v.50.0 or equal firefox and turn of automatic updates to keep same version for some time.Note – Comodo ice dragon web browser is one variation of mozilla firefox,just bit different,but still same,it doesnt use same profile files,becoz its possible install it and read profile files from same folder,so portable version of this web browser can be handy. Heya,some side note for extensions/addons,if you want try make them work,even after theirs support expiring,there are few ways,one is nightly tester tools->force compatibility,another additional option is about:config -> extensions.blocklist.enabled set to false , this is bit trickey option,use it in own risk,but working like charm,[almost always].My favorite firefox for now is v.47.0,multiprocess disabled [and automatic updates as well],becoz it does make incomptibile almost all my favoriter addons i want use.For newer versions of firefox,this suggested option might no longer work,becoz of multiproces [e10].